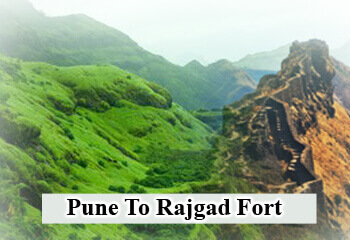 Rajgad meaning Royal Fort is one of the forts in Pune District of Maharashtra state. The total distance from Pune To Rajgad Fort is 58 kms it takes approx 2 hours to reach Rajgad fort. The main entrance door of Rajgad is known as the Mahadarwaja. Information about Rajgad Fort is that the fort was build on the hill named Murumbadevi Dongar which was capital of Maratha Empire during the rule of Shivaji Maharaj for almost 26 years. Rajgad fort was also one of the seventeen forts that Maharaj kept when the Treaty of Purandar was signed with the Rajput king jai Singh who was leading the Mughal forces. Tourists intrested in climbing Rajgad Fort takes a route From Pal Village (Bhosalewadi) it is the easiest route to climb. Rajgad is a fort which is located near katraj tourists can see Sinhagad and Torna fort from Rajgad as the height of Rajad is 4250 feet . Best season to visit Rajgad Fort is during winter and monsoon . Treakers feels fresh and fantastic but precautions to be taken as the mountain is slippery . Water and eatables are available while climbing the fort but one should have his own water bottle as 3 liters of water to be drunk by individual tracker. The eatables those are provided on the Rajgad Fort are poha Zhunka bhakar witrh brinjal bhaji along with a onion. The time thaken to climb the fort is 3hrs. If you are Planning a tour from Pune to Rajgad with a one day halt you can also find two temples there namly Padmavati where tourists can rest during night security is found there a group of 50 people can stay there. The highest point of Rajgad fort to climb is Balekilla it takes almost 2.5 hrs to climb.